In an increasingly interdependent world, communication and interaction with people in their own languages helps build positive relationships. In addition to the practical benefits of speaking other languages, knowledge of another language encourages different ways of viewing the world we share. 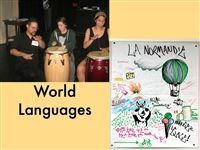 The World Languages Department is committed to promoting oral and written fluency while exposing students to the history and cultures of diverse regions united by a common language. Teachers use a dynamic approach that incorporates a broad array of materials, such as up-to-date texts and workbooks, classic and contemporary literature, films and shorts, documentaries, current events, internet sources, music and audio CDs. Class activities (designed to address various learning styles) may include pair and small group work, games, student-led classes, student presentations, skits and role-plays, student-made videos and iMovies, research projects, and exploring community resources. The department strives for student success by placing incoming ninth graders in the appropriate class for their abilities and by giving all students the support they need to feel confident and proficient in the target language. The large percentage of students who continue studying the language beyond the graduation requirement demonstrates their commitment. Summer trips led by department faculty provide an opportunity for some students to immerse in a culture and practice their language skills within a larger community.